Volcanic activity has played a dominant role in shaping the face of Earth. Much of the natural beauty of the land, its mineral wealth, and the fertility of the soil is owed to volcanism, especially in the western states. At one time or another during the last 70 million years, volcanic rocks covered nearly all of the western states of Washington, Oregon, California, Nevada, Arizona, Utah, Idaho, and large parts of Montana, Wyoming, Colorado, New Mexico, and Texas. Still older volcanic rocks, now largely deformed and metamorphosed, are found in nearly every state. Since the Mount St. Helens volcano, located in the state of Washington, erupted violently on May 18, 1980, volcanism has become a much-talked-about part of the weather and climate pictures of both the United States and the world. Much of the continuing importance of this spectacular eruption is owed to the fact that it lifted a great volume of ash and debris into the upper atmosphere. All the ash particles, even the finest, fell out within a matter of days, at most a few weeks. What remained dispersed in the stratosphere—for up to a few years—were aerosols of sulfuric acid droplets formed by the volcanic SO 2 gas in the eruption plume reacting with moisture in the air. Incidentally, Mount St. Helens only minimally affected climate (due to low levels of sulfur in the magma), compared with the 1982 eruption of El Chichón volcano (Mexico) and the 1991 eruption of Pinatubo (Philippines). Mount St. Helens erupting in 1980. Volcanoes are built by the accumulation of their own eruptive products: lava, bombs, ash, and dust. Usually the volcano is a conical hill or mountain around a vent (the term "volcano" also is applied to the opening or vent) that connects with reservoirs of molten rock (known as magma) below Earth's surface. Forced upward by the pressure of contained gas, the molten rock, which is less dense than the surrounding solid rock, rises buoyantly and breaks through zones of weakness in Earth's crust. It spews from the vent as lava flows, or shoots into the air as dense clouds of lava fragments. Larger fragments (bombs and cinders) fall back around the vent. Some of the finer materials (ash and dust) drift down and are blown by the wind to eventually fall to the ground many miles away. The gas in lava can be compared to the behavior of the gas in a soda bottle that is shaken and then the top released. The violent separation of gas from lava may produce rock froth known as pumice, which is so light that it floats on water if the gas bubbles are not connected. If the gas cavities are interconnected, the pumice does not float. There are four main types of volcanoes—cinder cones, composite cones, shield volcanoes, and lava domes. 1. Cinder cones are built of lava fragments. They are very numerous in the western United States including Sunset Crater, Arizona, and Craters of the Moon National Monument, Idaho. 2. Composite volcanoes are built of alternating layers of lava flows, volcanic ash, and ash; they are sometimes called strato-volcanoes. Many of the world's large mountains are composite cones; for example, Mount Fuji in Japan; Mount Shasta in California; and Mount St. Helens and Mount Rainier in Washington State. Crater Lake in Oregon is an interesting variation of a composite cone. Originally, like Mount Rainier, the volcano lost its summit in a series of tremendous explosions; the remaining parts of the volcano eventually collapsed to form the depression or caldera, later filled by water, that is now Crater Lake. Many small explosions since 1980 have built this lava dome (photographed in 1983) in Mount St. Helens crater. of shield volcanoes. Mauna Loa is the world's largest active volcano and rises 13,653 ft above sea level. In fact, Mauna Loa is the largest mountain (of any kind) in the world if its structure and height above the deep-sea floor, rather than sea level, is taken into account. Shield volcanoes are also very common in the Pacific Northwest (e.g., the "flood basalts" that constructed the Columbia River Plateau). 4. Lava domes are built of viscous or pasty lava extruded like toothpaste from a tube. Lassen Peak and Mono Dome in California are examples of lava domes. An excellent and photogenic example of a lava dome is that which formed within the new crater of Mount St. Helens following the May 18, 1980 explosive eruption. There are several areas in the United States where, for many thousands of years, the only activity has been that of hot springs and solfataras (steam vents). Yellowstone National Park is the most famous of these areas. It is visited each year by thousands of people who come to see the geysers, mud pots, boiling hot springs, steam vents, and beautiful carbonate and silica deposits formed by precipitation from the hot waters. Such phenomena are vestiges of a former period of very active volcanism. It cannot be determined with certainty, however, that someday more violent volcanic activity will not begin again. The youngest and most dominant volcanic eruptions in Yellowstone Park produced lavas called rhyolite. Chemically, rhyolite is high in silica and is the volcanic equivalent of granite. Among active volcanoes rhyolite is exceedingly rare. In the geologic past, however, rhyolite eruptions were more common and among the most spectacular of natural phenomena. Over 600 mi 3 of rhyolite erupted from the Yellowstone volcanoes alone during their last active periods. These rhyolitic ash flows also form extensive plateaus (e.g., the Yellowstone Plateau). Two-thirds of this amount erupted as ash flows like the "river of sand" that produced the "Valley of Ten Thousand Smokes" in Alaska in 1912. The remaining 200 mi 3 of material issued as great sticky lava flows. So great was the volume of flows of ash and pumice that valleys were completely filled and the intervening ridges were covered. The ash flows merged to form flat-topped plateaus thousands of square miles in area. When deposited, these great sheets of ash were so hot that the particles fused together to form rocks known as welded tuffs. Recent geologic studies have revealed that welded tuffs are perhaps the most abundant rhyolitic rocks in the western United States. Tens of thousands of cubic miles are known in Nevada alone, and great volumes are also recognized in the San Juan Mountains of Colorado, southwestern New Mexico, the Big Bend region of Texas, and southwestern Arizona. In the Jemez Mountains of New Mexico, about one million years ago, eruptions similar to those at Yellowstone produced nearly 50 mi 3 of welded tuffs. Removal of this large volume of material from the abyssal storage chamber caused a great circular block of Earth's crust (more than 10 mi in diameter) to subside several thousand feet, producing a giant caldera at the surface. Formation of this caldera, the Valles Caldera, was similar to that of Crater Lake, but of special interest to geologists is the subsequent, more complex history of the Caldera. Renewed pressure from below uplifted and arched the subsided circular block (called the resurgent dome), so that its center rose even higher than its original elevation. During and after this uplift, new eruptions of rhyolitic lava broke out along the fracture system around the uplifted circular block and built a ring of 15 new volcanoes. Detailed studies of the Valles Caldera have allowed geologists to relate this rhyolitic volcanism to more deeply seated processes of granite formation. Volcanism of this type is now known to have occurred in many other areas of the United States. The San Juan Mountains of Colorado are an outstanding example, as are the Mono Craters in California. They, like Little Glass and Big Glass Mountains in northeastern California, are famous for black volcanic glass (obsidian) and for the large blocks of pumice that have become popular as ornamental stones. The Mono Craters include some of the world's finest examples of rhyolitic pumice cones and lava domes. Their forms range from simple, almost perfectly symmetrical cones of pumice and ash, to cones whose craters are partly or completely filled or overflowing with lava. Some cones are completely covered with lava flows that have piled up to form steep-sided lava domes. Those cones containing lava that did not overflow the crater rim are similar to the plug dome of Lassen Peak, but are much smaller and formed by more fluid lava. Recurrently, throughout geologic time, very fluid basaltic lava has erupted from swarms of fissures to form vast lava plateaus. The Columbia River Plateau of Washington and Oregon and the Snake River Plains of Idaho are among the finest examples of this type of volcanism. The Columbia River Plateau has an area of 100,000 mi 2 , and the total volume of basaltic lava approximates 35,000 mi 3 . Individual lava flows can be traced for distances of more than 100 mi. Such lava must have been almost as fluid as water to have covered such large areas so uniformly. Known as the "Ring of Fire," this belt of high volcanic and seismic activity surrounds the Pacific Ocean. lavas. Pahoehoe is very fluid lava with a smooth-to-ropy surface and flows that may travel long distances. Aa lava is a more viscous lava that forms steep-sided flows seemingly composed only of craggy blocks, but usually containing a continuous fluid interior. Occasionally the surface and sides of these basaltic lava flows solidify to form a thick outer crust. Yet the hot lava inside continues its forward movement and eventually drains out of its own crust to form lava tunnels or lava tubes. Water entering such tunnels may freeze in the winter and, because of the excellent insulation provided by the basalt crust, may not thaw in the summer even under desert conditions. Excellent examples of these ice caves and lava tunnels may be seen in the Modoc Lava Beds National Monument, California. Basaltic lava fields in cinder cones are numerous in many parts of the western United States. Some of these are isolated volcanic vents, but basaltic vents are commonly clustered near or around large volcanoes composed of andesitic and similar lavas. Fine examples of the clustered types are the volcanic fields of the San Francisco Mountains, Arizona, and Mount Taylor, New Mexico. Hundreds of other localities for volcanoes and volcanic rocks are known, and this very brief discussion simply serves to emphasize that the United States, particularly the West, has been one of the most volcanically active areas in the world over geologic time. Geologists do know the "causes" of volcanism, but what they do not know with any certainty is the frequency of eruptions for volcanic systems. Does a given volcano, on average, erupt every few years, decades, centuries, or millennia? Or are the eruptions separated by long periods of inactivity (even millions of years)? For example, we know that the Yellowstone system during the past 2 million years had three huge eruptions about 600,000 years apart. So, from that average eruption frequency, we are about due for another huge one. It could erupt again in our lifetime, but the mathematical probability is very, very low. We can be sure, however, that in our lifetime volcanoes in Hawaii and Alaska will erupt many times again. "Active volcanism" is vague terminology and requires some kind of time context. Unfortunately, volcanologists have not agreed on the criteria to distinguish between "active," "dormant," and "extinct" volcanoes. A commonly used but inadequate definition of an "active" volcano is one that has erupted one or more times in recorded history. 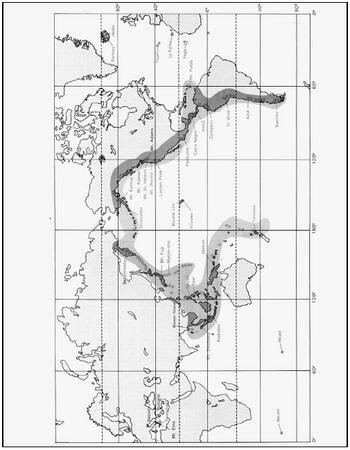 The problem is that "recorded history" of an Old World volcano-containing country (e.g., Japan, Italy, Iceland) differs from that of a New World country (e.g., United States, Mexico, Ecuador). For example, we know that eruptions have occurred within the last 200 years, but have not been chronicled, in the Inyo-Mono chain in California. From the geologist's perspective, California has not had "active" volcanism. Active volcanism in the United States is presently confined to the Hawaiian Islands, the Aleutian Islands, the Alaska Peninsula, and the Cascade Mountains. The Hawaiian Islands consist entirely of volcanic rocks that form giant shield volcanoes; two (Mauna Kea and Mauna Loa) rise nearly 30,000 ft from the ocean floor. By far the dominant rock type is dark gray-to-black basalt in the form of lava flows, cinders, pumice, ash, and bombs. On the island of Hawaii are Mauna Loa, the largest volcano in the world, and Kilauea, one of the most active. During an eruption at Kilauea in 1959–60, great fountains of lava, some as high as 1,900 ft, were observed near the volcano summit. Lava from the fountains ran into an old pit crater and filled it to a depth of 365 ft, forming a lava lake. Late in 1963, nearly four years after the eruption, the crust on top of the lake was nearly 50 ft thick and the temperature of the lava below the crust was still about 2,000°F. The Aleutian Island arc, including the Alaska Peninsula, is more than 2,000 mi long and contains about 36 historically active and many extinct volcanoes. Among them are some of the world's most beautiful, but little-studied, volcanoes. The composite volcanoes Pavlof, Shishaldin, and Pavlof Sister are examples. Bogoslof Island is a disappearing volcano, having emerged and submerged in the sea more than once in historic time. Most of the Aleutian lavas consist of black-to-gray rocks called basalts and andesites. Of the several active volcanoes on the Alaskan Peninsula, Mount Katmai (Katmai National Monument) is the most notable. In 1912, one of the most remarkable eruptions of historical time occurred near its base. The "river of sand," as the early explorers called it, flowed for more than 15 mi down a great glacial valley, filling it to a depth of more than 400 ft. This valley is known as the "Valley of Ten Thousand Smokes" because of the thousands of fumaroles (gas vents) that formed on the surface of the volcanic deposits and gave off steam and other vapors for many years. In the Cascade Mountains of Washington, Oregon, and California are the well-known composite cones of Mounts Baker, Rainier, St. Helens, Adams, Hood, Mazama (Crater Lake), and Shasta. These high Cascade volcanoes are built primarily of rocks called andesites, which are intermediate in chemical composition between basalts and rhyolites. Andesitic volcanoes are usually great cones of rubble consisting of interlayered lava flows, ash deposits, and fragment deposits called mud flows. These form when eruptions take place through crater lakes, when fragmented lavas and landslides enter streams, or when water from melting snow or rain saturates and mobilizes previously erupted deposits. Volcanic mud flows may be hot or cold and may deposit boulders weighing many tons. Very young mud flow deposits are common on the flanks of Mount Rainier and other Cascade cones. Volcanoes of the Hawaiian Islands. In some areas of the world, mud flows have been the major cause of destruction and loss of life during volcanic catastrophes. Such an eruption in 1919 from Kelut volcano in Java covered 50 mi 2 of land with mud and lava blocks. More than 5,000 human lives were lost and 100 villages completely or partly damaged. This great devastation was caused by the ejection of over 1 billion cubic feet of water from Kelut's lake. Mount Mazama (Crater Lake) is the volcano that lost most of its top about 7,000 years ago during a tremendous explosive eruption. Nearly 12 mi 3 of ash and pumice erupted, producing under the volcano a void so large that the top caved in to form a great hole 6 mi across. Depressions formed in the top of volcanoes in this manner are known as calderas. They differ from craters that are produced by explosion rather than by collapse. The caldera of Mount Mazama is now filled with water to a depth of over 1,700 ft and is known as Crater Lake. Lassen Peak is famous among volcanoes because it is one of the largest known plug domes. A plug dome is a part of a volcano formed by the vertical rise of a great sticky mass of lava that remains standing above the crater rim. Commonly, great vertical grooves are formed in the margin of the dome as the material oozes from the orifice. The mechanism may be compared to the squeezing of toothpaste from a tube. Subsequent eruptions from plug domes are among the most dangerous known. Gasses dissolved in the lava may burst forth violently, shatter the dome, and cause the formation of extremely mobile avalanches of hot blocks, rock dust, and gas. Such avalanches may travel at speeds up to 100 mph and devastate everything in their paths. It was an eruption of this type in 1902 from Mount Pelee in the West Indies that destroyed the nearby town of St. Pierre and killed nearly 30,000 people. Mount St. Helens is a symmetrical volcanic cone in southwestern Washington about 45 mi northeast of Portland, Oregon. Most of the cone that can be seen now was formed within the last thousand years—but this overlies an older volcanic center that probably has existed for at least 40,000 years. 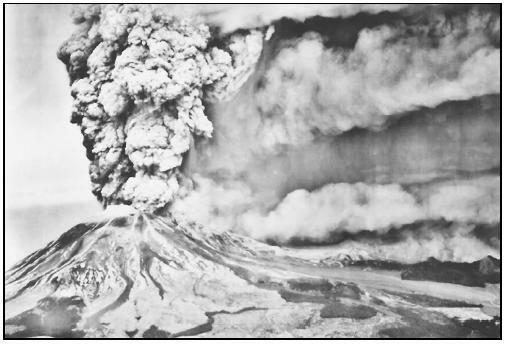 Mount St. Helens has had a long history of spasmodic explosive activity. It is an especially dangerous volcano because of its past behavior and the high frequency of its eruptions during the past 4,500 years. Volcanoes of the Aleutian Island arc. On May 18, 1980, a powerful explosion occurred from Mount St. Helens at 8:32 A.M . that was heard 200 mi away. The explosion climaxed a series of activities that began with an earthquake shock of magnitude 4.1 on March 20, 1980. Remarkable photographs, taken as the explosion began, show the north flank breaking away from the volcano as a large vertical cloud began to rise from the summit. The eruption column of ash and gas rose very rapidly to more than 10 mi above sea level; passing through the tropopause at 7 mi. Winds blew the cloud to the east. Ashfall at Yakima, 90 mi away, totaled as much as 4–5 in and caused respiratory problems for some residents. By mid-afternoon, the ash had reached Spokane, reducing visibility to only 10 ft, although only half an inch was deposited there. Almost 2 in of ash were reported from areas of Montana west of the Continental Divide, but only a dusting fell on the eastern slopes. Slight ashfall occurred in Denver on May 19. The ash blew generally eastward for the next several days, causing some problems for aircraft over the Midwest. The U.S. Geological Survey (USGS) identified three components of the initial eruptive event in addition to the vertical cloud. The first component was a directed blast that leveled the forest on the north and northwest flanks for a distance of up to 15 mi from the former summit. The blast swept over ridges and flowed down valleys, depositing significant quantities of ash. Although the blast was hot, it did not char fallen or buried trees. Many persons are known to have been killed by the blast, and others in the devastated zone went missing. The second component was a combined pyroclastic flow and landslide that carried the remnants of the north flank uplift across the lower slopes and about 17 mi down the Toutle River valley, burying it to depths as great as 180 ft. Large quantities of mud, logs, and other debris clogged several valleys around Mount St. Helens and rendered some shipping lanes impassible in the Columbia River. The third component was a pumiceous pyroclastic flow, funneled northward through the breach formed by the destruction of the north flank bulge. This flow dammed the outlet of Spirit Lake, trapping a large quantity of water. The volcano maintained an eruption column 10 mi high until a relatively sudden diminution of activity occurred in the early morning of May 19. The altitude of the top of the column decreased to about 2.5 mi. Activity continued to weaken through May 22. A new elliptical crater about a quarter mile deep was formed by the explosion. Preliminary analysis of seismic and deformation data indicates that there was no immediate warning of the imminence of a large explosion. A magnitude 5.1 earthquake occurred essentially simultaneously with the explosion at 8:32 A.M . The tilt data were fragmentary and not diagnostic. Actually, the "inflation" began as early as March 20, 1980 with the onset of the first precursory earthquakes and the intrusion of magma "cryptodome" to begin forming the "bulge." Although volume estimates for this eruption are very rough, comparison with previous eruptions in the Smithsonian Institution's Volcano Reference File (a computer data file of the world's volcanoes and their eruptions) indicates that explosions of this size occur only about once a decade. The May 18 eruption ejected about 0.3 mi 3 of uncompacted ash. Mount St. Helens has erupted 22 times since May 18,1980. On 19 occasions the eruption has been predicted, as scientists use more sensitive equipment to pick up ground vibrations and super-accurate lasers to detect the most minute "bulges" that occur in the slope of the mountain. Twenty years ago in late March, southwestern Washington's Mount St. Helens, a volcano in the Cascade Range, awoke from a 123-year slumber. Following two months of precursory activity including sustained energetic seismicity, phreatic (steam-blast) explosions, and rapid bulging of its north flank from magmatic intrusion, Mount St. Helens erupted cataclysmically on the morning of May 18, 1980. This eruption caused the worst volcanic disaster in the recorded history of the United States, resulting in 57 deaths, scores of injuries, and economic losses exceeding $1 billion. Because it was thoroughly documented and received substantial media attention, the eruption and its aftermath ushered in two decades of heightened public awareness and expanded scientific studies, launching a veritable renaissance in volcanology that continues into the twenty-first century. The reawakening of Mount St. Helens happened while Robert I. Tilling was head of the Volcano Hazards Program of the USGS and he was thus responsible for directing the survey's scientific response to the eruption. The 1980 and subsequent eruptions of Mount St. Helens furnish many lessons, not only scientific findings relevant to reducing volcano risk, but also lessons regarding the critical need for effective communication among scientists, emergency management officials, members of the media, and affected populations. Seconds after a 5.1 magnitude earthquake, the north flank of Mount St. Helens began to collapse, unleashing a powerful, laterally directed blast, comparable in some ways to the sudden removal of the cap from a vigorously shaken bottle of soda. This collapse produced a rockslide-debris avalanche of 0.5 mi 3 , the world's largest in historical time. Although it lasted less than five minutes, the lateral blast traveled at speeds of up to 620 mph, extending out as far as 373 mi and devastating 230 square miles of land north of the volcano. This blast, much more powerful than any other in the volcano's history, was the principal cause of fatalities. Ash fallout from the eruption affected more than 22,000 square miles in eastern Washington and neighboring states. The ash cloud drifted across the country in three days and ultimately circled the globe in about two weeks. Within 10 minutes of the eruption's onset, the interaction of hot volcanic ejecta with snow and ice triggered lahars (volcanic mudflows) that caused widespread flooding and damaged roads, bridges, and other structures. Volcano hazards can be multiple (e.g., flank failure, debris avalanche, lahars, lateral blast, pyroclastic flow, tephra [solid material, usually ash] fall, flooding, and sedimentation), and they can happen in a very short time, from tens of seconds to a few hours. Communities far distant from a volcano can also be vulnerable to damaging hazards. Prolonged, increased sediment transport following explosive eruptions can have socioeconomic and environmental consequences that are more severe than the direct consequences of the actual eruption. 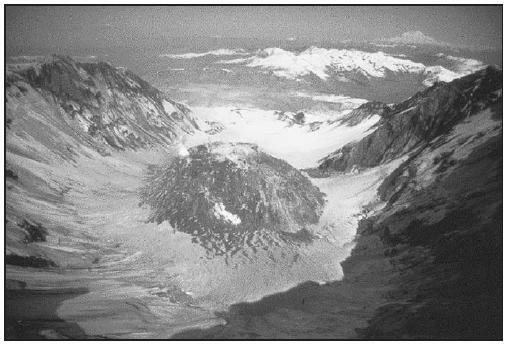 When activity began at Mount St. Helens in late March 1980, the USGS began intensive monitoring in cooperation with the Geophysics Program of the University of Washington. Data clearly indicated magmatic intrusion high into the volcanic edifice and the growing instability of the bulge on the north flank, but it was impossible to predict the onset of the events of May 18. Nevertheless, the monitoring data indicated to scientists that a flank failure might trigger a large magmatic eruption. Indeed, the on-site scientific team explained this scenario to emergency management officials before May 1. Volcanologists now regard any significant rapid deformation of a volcano, as was well documented at Mount St. Helens, as a warning of a potential sector collapse and lateral blast. Besides monitoring the volcano around the clock, USGS scientists also worked daily with the U.S. Forest Service, the principal land manager for Mount St. Helens, as well as two counties and other government agencies, to provide updates of potential hazards and advice on mitigation and preparedness measures. By April 1, the USGS had developed a large-scale hazards zonation map and related hazards assessment information that were essential for preparing the Forest Service's Mount St. Helens Contingency Plan (which was completed April 9) and for locating roadblocks and restrictions on public access. Had these measures not been taken, the eruption would have caused considerably more casualties. However, while the USGS response to Mount St. Helens was successful overall, it was hardly perfect. Lack of equipment, along with logistical difficulties, meant geodetic measurements of the north flank (bulging at an average rate of about 5 ft per day) did not begin until mid-April, several weeks after the bulge was first recognized. We will never know how much difference, if any, earlier measurements might have made. Why didn't the USGS and Washington State take more action before 1980? By repeating the baseline monitoring measurements that had been initiated in the early 1970s and by developing protocols for working with other agencies, private organizations, and the public, they could have prepared both earlier and better for a reawakening of Mount St. Helens. After all, the USGS knew of the potential hazards as early as the late 1960s. Moreover, in 1975 three USGS geologists (Crandell, Mullineaux, and Rubin) published in Science a long-term forecast stating that Mount St. Helens would be the most likely volcano in the Cascade Range to reawaken, possibly even "before the end of the twentieth century." In 1978, Crandell and Mullineaux published a detailed volcano hazards assessment that received little notice, but after the onset of activity in 1980 this report was widely read by scientists and emergency management officials. The Survey's lack of preparation in part stemmed from insufficient funds for additional work in the Cascades; and repeated efforts to obtain increased appropriations for volcano hazards studies had all failed. After the 1980 eruption, however, funding for the USGS Volcano Hazards Program increased significantly and was more than sufficient to establish the Cascades Volcano Observatory in Vancouver, Washington, to monitor Mount St. Helens and other Cascades volcanoes. The funding also expanded or initiated studies of other volcanoes in the United States. The lesson is obvious and disturbing: justification for increased funding of volcano hazards studies is greatly strengthened and perhaps only receives serious attention following a volcanic crisis or disaster. Since 1980, scientists have made numerous advances in volcano monitoring. The scientific and public responses to two volcano crises outside the United States, Nevado del Ruiz (Colombia) in 1985 and Mount Pinatubo (Philippines) in 1991, underscore the lesson of Mount St. Helens regarding the need for effective communications among scientists, emergency responders, and the public. On November 13, 1985, a very small amount of magma erupted from Colombia's Nevado del Ruiz volcano, triggering destructive lahars that killed more than 23,000 people. This tragedy could have been averted; a hazards zonation map had been prepared a month earlier and scientists had provided adequate warning that went unheeded. The Ruiz disaster was the impetus for the International Association of Volcanology and Chemistry of the Earth's Interior to produce Understanding Volcanic Hazards , a video that depicts the deadly outcomes of volcano disasters, and Reducing Volcanic Risk , a video that shows what communities can do to mitigate volcanic hazards. The Ruiz experience also launched the Volcanic Disaster Assistance Program (VDAP) in 1986, which is jointly funded by the USGS and the Office of Foreign Disaster Assistance of the U.S. Agency for International Development. Once officially invited, a VDAP team can quickly deploy a mobile volcano observatory to help host countries respond to volcanic crises. In contrast to the 1985 Ruiz catastrophe, the response of scientists and emergency management officials to the 1991 eruption of Mount Pinatubo in the Philippines saved thousands of lives and reduced economic loss by hundreds of millions of dollars. Fatalities directly attributed to Pinatubo numbered fewer than 300, thanks to the timely evacuation of 250,000 people. Scientists from the Philippine Institute of Volcanology and Seismology and the VDAP team educated local authorities and populations about the eruption and its potential hazards using a draft version of the Understanding Volcanic Hazards video that convinced local officials to order evacuations and the people at risk to comply. Some trends of the past two decades continue into the twenty-first century, including the continued development and improvement of real-time volcano monitoring networks and methods, particularly the use of satellite technology. Worldwide eruption frequency (on average, about 60 volcanoes are active each year) is not likely to decrease in the foreseeable future. Thus, with continued growth in world population, economic development, and urbanization, the global risks due to volcanoes will become more acute. However, even as we look forward to continuing advances in volcanology and hazards studies, the 1985 Ruiz disaster provides a tragic reminder that good science alone is not enough. The greatest payoff in risk reduction will come from increased focus on the societal and human issues that emerge during volcanic crises and from developing or improving communication among scientists, emergency managers, representatives of the news media, educators, and the general public. The major challenge, indeed the goal, for volcanologists and other scientists is to prevent volcanic crises from turning into volcanic disasters. Volcanic hazards (lava flows, mudflows, hot rock avalanches, ashfalls, and floods) are limited to areas in the western United States, principally in the Cascade Mountain Range in California, Oregon, and Washington; in Idaho's Snake River Plain; and in parts of Arizona, New Mexico, and Utah. No volcanic hazard areas are known east of New Mexico. The short term risk from volcanic hazards is generally low because destructive eruptions are relatively infrequent. Severely destructive effects of eruptions, other than extremely rare ones of catastrophic scale, probably would be limited to areas within a few tens of miles down-valley or downwind from a volcano. Thus, the area seriously endangered by any one eruption would be only a very small part of the western United States. Except for Mount St. Helens' renewed activity in 1980, the only explosive volcanic eruption in the contiguous states since the area was settled by Europeans was 10,457-ft-high Mount Lassen in northern California during a series of eruptions in 1914–15. The Mount Lassen eruption was moderate compared to major eruptions at other volcanoes in the world during recorded history. No one was killed in the Mount Lassen eruption, and damage was minor. Eruptions of moderate volume may occur somewhere in the Cascade Range as often as once every 1,000–2,000 years, but very large eruptions may occur no more than once every 10,000 years. A few large cataclysmic eruptions have occurred during the last two million years in and near Yellowstone National Park, at Long Valley, California, and in the Jemez Mountains of New Mexico. 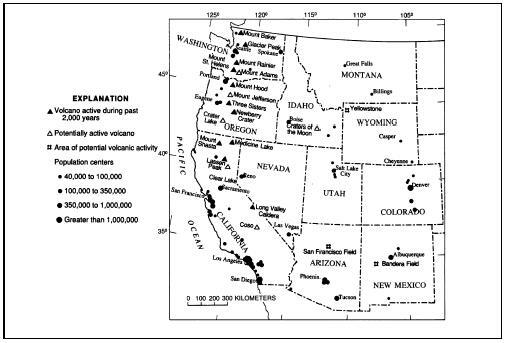 These eruptions affected very large regions and deposited ash over much of the western United States. Such cataclysmic eruptions were not considered in outlining potential hazard zones. These eruptions are so infrequent that it is not possible to judge whether one might occur during the time for which planning is feasible. Risk from volcanic hazards decreases as distance from an erupting volcano increases. Lava flows are nearly uniformly destructive to their outer limits. Some other volcanic hazards, especially ashfalls, become less destructive and less frequent with increasing distance. The boundary of such a hazard is indefinite and often dependent upon land use. For example, an ashfall a half-inch or so thick might cause little damage to structures, yet destroy crops. 1840-1870: Historical literature refers to several episodes of small tephra-producing events in the mid-1800s, and increased fumarolic activity began in Sherman Crater near the summit in 1975 and remains elevated through the late 1990s. 1600-1700s: Two hundred to three hundred years ago, small eruptions deposited pumice and ash east of the volcano, and may have been observed by Native Americans. 1894 and early 1800s: Several eyewitness accounts describe minor releases of steam and ash-laden steam during November and December 1894. The most recent eruption that formed a thin and discontinuous tephra layer, however, occurred during the first half of the nineteenth century. 1980–1986: Large explosive eruption on May 18, 1980, followed by 21 smaller eruptive episodes. The last 17 episodes built a lava dome in the volcano's crater. 1800–1857: Large explosive eruption in 1800 was followed by eruptions of lava that formed a lava flow on the volcano's northwest flank (Floating Island lava flow) and a lava dome on the north flank (Goat Rocks lava dome). Late 1700s: Layers of volcanic rocks record a variety of activity related to the growth of a lava dome at the volcano's summit, including pyroclastic flows, lahars, and tephra fall. 1856–1865 and late 1700s: According to eyewitnesses, small explosive eruptions occurred from the summit area between 1856 and 1865. In the latter half of the eighteenth century, however, a lava dome was erupted, which was accompanied by pyroclastic flows, lahars, and tephra fall. 1786: An eruption cloud was observed above the volcano from a ship passing by the north coast California, and the activity included pyroclastic flows. 1914–1917: A series of small explosions that began on May 30, 1914, was followed 12 months later by extrusion of lava from the summit and a destructive pyroclastic flow and lahars on May 21, 1915. Minor activity continued through the middle of 1917. 1790 to present: First written record of eruption at Kilauea was in 1823; strong explosive activity occurred in 1790. 1832 to present: First written record of eruption at Mauna Loa was in 1832 (eyewitness was on Maui, 118 mi away). 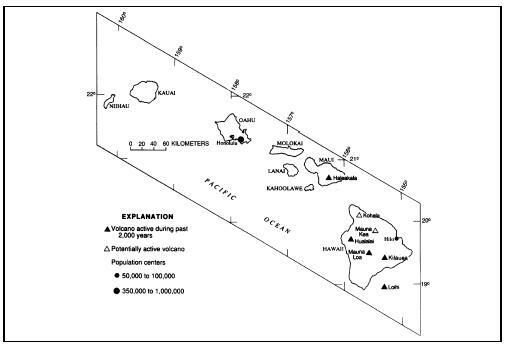 Late 1700s–1801: Six different vents erupted lava between the late 1700s and 1801, two of which generated lava flows that poured into the sea on the west coast of Hawaii. 1790: Two lava flows erupted on the southwest flank and reached the sea. A swarm of a few dozen small earthquakes beneath Mount Hood that began January 11, 1999, prompted scientists to release an information statement on the afternoon of January 14. In the statement, scientists describe the earthquakes as most likely due to the regional tectonic stress rather than to the movement of magma. Since 1990, Mount Hood has generated about 15 earthquakes swarms similar to the January 1999 quake. Lava continues to erupt from Pu'u O'o cone and travel through lava tubes into the sea. New land created by lava entering the sea collapses into the ocean repeatedly. An eruption update is available from the USGS Hawaiian Volcano Observatory. The Pu`u `O `o-Kupaianaha eruption of Kilauea, now in its 19th year and 55th eruptive episode, ranks as the most voluminous outpouring of lava on the volcano's east rift zone in the past five centuries. By September 2002, 2.3 km 3 of lava had covered 110 km 2 and added 220 hectares to Kilauea's southern shore. In the process, lava flows destroyed 189 structures and resurfaced 13 km of highway with as much as 25 m of lava. Beginning in 1983, a series of short-lived lava fountains built the massive cinder-and-spatter cone of Pu'u' O'o. In 1986, the eruption migrated 3 km down the east rift zone to build a broad shield, Kupaianaha, which fed lava to the coast for the next 5.5 years. When the eruption shifted back to Pu'u 'O'o in 1992, a series of flank-vent eruptions formed a shield banked against the uprift side of the cone. Continuous eruption from these vents undermined the west and south flanks of the cone, resulting in large collapses of the west flank. In May 2002, a new vent opened on the west side of the shield and fed flows down the western margin of the flow field, sparking the largest forest fire in the park in 15 years. These flows reached the ocean near the end of Chain of Craters Road in July, and as many as 4,000 visitors per day flocked to view flowing lava up close for the rest of the summer. Earthquake activity beneath the volcano has decreased since the small earthquake swarm in mid-1998 (May–July). Scientists interpret the swarm as representing a pulse of magma that moved in the volcano's magma reservoir. The current condition of the caldera is GREEN (minor unrest posing no immediate risk). Earthquake activity is relatively low; the most recent significant earthquakes occurred on June 8, 1998, and July 14, 1998 (magnitude 5.1); a few aftershocks continue to occur. Deformation measurements within the caldera indicate that, following a period of little change from mid-April through mid-August, the resurgent dome has resumed slow inflation at a rate averaging 0.39–0.78 in per year. 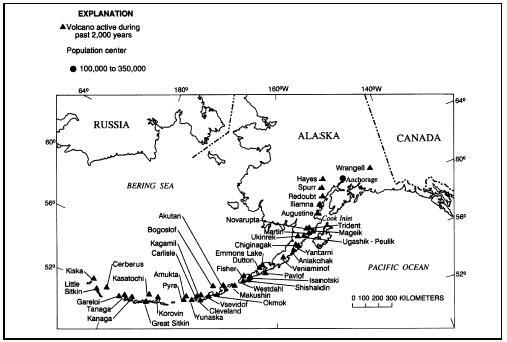 Scientists of the Alaska Volcano Observatory (AVO) received reports on the morning of June 30, 1998, that a small eruption column above Korovin volcano had reached nearly 16,000 ft above sea level. Korovin volcano is located on the north end of Atka Island in the central Aleutians, 334 mi west of Dutch Harbor and 1,100 mi southwest of Anchorage. It is 13 mi north of the village of Atka, population about 100. Local winds at the time of the reports were light and to the south-southwest, and a dusting of ash was reported in Atka. AVO does not maintain seismic monitoring equipment on Atka Island, and relies on satellite and field observations for monitoring the status of Korovin. No activity has been observed since June 1998. The intense swarm of earthquakes beneath Lake Becharof that shook the Alaska Peninsula beginning May 8, 1998, declined significantly. The swarm began with five earthquakes of magnitude 5.2–4.7. The earthquakes have been clustered on the southwest shore of Lake Becharof, several miles northwest of the 1977 Ukinrek Maars volcanoes. No volcanic activity (for example, fumarolic activity or steam-driven explosions) or ground cracks have been observed since the earthquake swarm began. If you are outside, seek shelter such as a car or a building. When air is full of ash, keep your eyes closed as much as possible. Heavy falls of ash seldom last more than a few hours—only rarely do they last a day or more. Heavy falls of ash may cause darkness during daylight hours and may temporarily interfere with telephone, radio, and television communications. Do not try to drive a car during heavy fall of ash—the chance of accident will be increased by poor visibility. Reports of increased steaming, snowmelt, and sulfur smell at Chiginagok Volcano were received by AVO beginning October 22, 1997. Robust steam plumes have issued from an active fumarole at an elevation of about 5,500 ft on the north flank of the volcano since at least 1943 and sulfur deposition in the vicinity of the fumarole discolors the adjacent snow and ice. Reports of historic activity at Chiginagak are poorly documented. The volcano is not monitored by seismic instrumentation. Fish and Wildlife Service personnel in the field and citizens of Pilot Point reported that on Thursday, August 13, 1998, the usual white steaming from Chiginagak fumaroles changed for a time to puffs of black ash accompanied by a greenish yellow gas and steam plume rising about 500–1,000 ft above the volcano. That's so detailed& Descripted!It's very interesting.And so scary! I dont think u have in of information on the volcano of hualalai. I honestly think u should of added a little bit of more information. But on the rest you did perfectly fine i loved the information you put and it really helped me in my project that i had to do about science. Thank you very much. Wow there are so many! I didn't reailze that people can climb all these. It really is a great experience that I recommend everyone try once. Great list! =) Andrea recently posted..